All 89 DMK Member evicted, suspended from Tamil Nadu Assembly too : All 89 MLA of DMK Party in Tamil Nadu who attended the Legislative Assembly session on Wednesday were suspended and evicted a masse from the Assembly House. According to a report of The Hindu newspaper that the expulsion took place after a commotion over a mocking remark made by an AIADMK legislator on MK Stalin’s Nammaku Naame road show. O Panneerselvam who is the Finance Minister and leader of the House, moved a resolution seeking the suspension of all DMK legislators and alleging that they were disrupting the proceedings in the house. Speaker of Tamil Nadu Assembly House P Dhanapal accepted the resolution and ordered the suspension of all MLA of DMK party for a week. According to the reports that Stalin told the media later that the expulsion and suspension of the MLAs of DMK party was a planned action to prevent them from raising issues during the demand for debate for grants to the Home Department, which is being handled by Chief Minister Jayalalithaa. 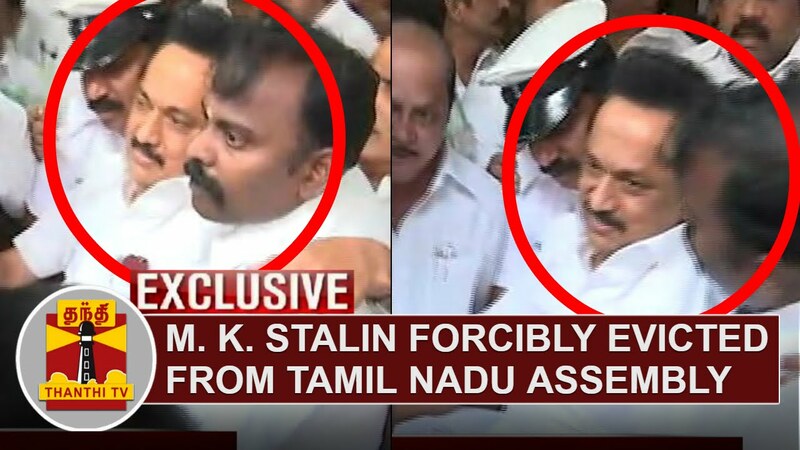 Stalin claimed that every day, ruling party’s Ministers and legislators were making comments deliberately to provoke the MLAs of DMK into launching a protest.